Our 2013 Medical Gas Expo & Educational Seminar was a huge success! It was held at the AmericasMart in Atlanta, GA on March 21st. Over 40 hospital personnel, engineers, and other medical industry professionals were in attendance. President and CEO of EMGS, Tot Darden presented on the 2012 edition NFPA 99 code changes. Guest speaker Jaime Valdivia with NITC spoke on the ASSE credentialing standards. Jaime has 29 years of experience as a craftsman of the plumbing and pipefitting industry. He has held a medical gas installer credential since 1987 by completing a four year apprenticeship program. Jaime holds certifications as a Journeyman plumber, Journeyman pipefitter, Master Plumber, Foreman, and for Green Awareness and also possesses a Los Angeles City Plumber license. Jaime is a graduate of the United Associations Instructor Training Program and he is former instructor of the Apprentice and Journeyman program in Southern California. He earned an Associate in Applied Science as an Honors graduate in the field of Industrial Training and acquired a Bachelors of Arts in Labor Education from the National Labor College. 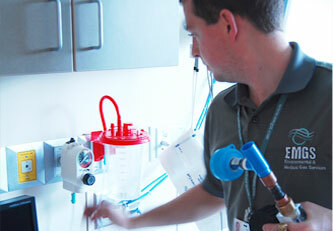 Matt Nimershiem with Lokring shared his expertise on Lokring fittings in medical gas systems. Matt has been with Lokring for 20 years, and is considered by the company to be their medical gas specialist. Matt has been involved with the medical gas industry since the introduction of the product to the NFPA 99 committee and was instrumental in the usage of Lokring at the recently completed Walter Reed Military Medical Center project in Bethesda, MD. Matt holds a Mechanical Engineering degree from Virginia Tech and is a member of ASHE, ASME, and ASNE. Joseph Messina, Plumbing Section Manager for HDR Architecture, was another guest speaker. He spoke on Chapter 8 of NFPA 99. He has more than 35 years of engineering experience, in the design and engineering of plumbing systems with an expertise in research facilities, hospitals, detention facilities and civic. Joseph is very active in the Atlanta Chapter of ASPE, serves as VP of Education on the chapter board, and is on the ASPE Educational Committee. He has also authored the Designers Notebook column in the Plumbing System and Design Magazine. With 25 years of experience with the design, marketing and services of air compressor and vacuum pump systems for medical, research, and industrial facilities Don Goggans with Powerex was able to conclude our forum with his knowledge on source equipment for labs & hospitals. Don has been a member or speaker of Medical Gas Professional Healthcare Organization, American Society of Plumbing Engineers, and American Society of Healthcare Engineers. We are very appreciative that all of these well-informed men got to share their invaluable ingenuity, and be a part in our educational forum. Please make plans to join us for future educational seminars. Contact Terri Clayton for further information at 770-459-5920.
also show who is typically responsible for ensuring these measures are attended to. providing care to their patients. The 2012 edition of NFPA 99 has been published. EMGS, Inc. has developed an online two-hour course and exam to cover the changes made from the 2005 to the 2012 edition. If you are interested in purchasing the book or registering for the course, please contact Caroline Darden at 770-459-5920.